May 24, 2012 - Bombardier Aerospace announced that the hydraulic system for its all-new CSeries aircraft has been commissioned on "Aircraft 0" the company's on-the-ground systems test rig. Along with the electrical system, which was commissioned earlier this year, the hydraulic system will permit enhanced validation testing of the CSeries family of aircraft's integrated systems prior to first flight. This is an important milestone that now allows for the operation of the actuation systems for the aircraft's flight control surfaces, thrust reversers and landing gear. The successful commissioning of the hydraulic system was supported by Parker Aerospace the contracted supplier of the hydraulic work package and other structural and system suppliers that delivered the components and tubing parts that run throughout the complete aircraft. "Excitement in the development of the CSeries aircraft keeps building as 'Aircraft 0' matures and provides us with the ability to collect more data in sophisticated areas - particularly as we prepare to power up the flight systems. The commissioning of the hydraulic system on 'Aircraft 0' moves us along in the schedule as we drive towards first flight of our CSeries aircraft," said Rob Dewar, Vice President and General Manager, CSeries, Bombardier Commercial Aircraft. "Every week, the testing and delivery of key components and systems from our suppliers around the globe helps make the CSeries aircraft real. Bombardier's collaborative approach to supply chain management is showing real benefits and delivering outstanding results as the progress continues and specific systems are powered up for on-the-ground validation." Also known as the Complete Integrated Aircraft Systems Test Area, "Aircraft 0" is located at the company's Mirabel, Quebec facility, 40 km north of Montreal. The progressive commissioning of the systems will be ongoing throughout the year to ensure continued aircraft validation on the ground, prior to flight testing. 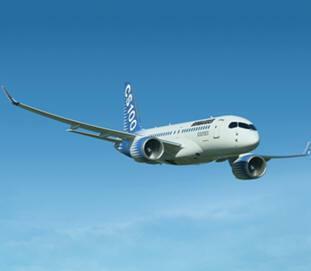 Designed for the growing 100 to 149 seat market, the 100 per cent new CSeries aircraft family combines advanced materials, leading-edge technology and proven methods to meet commercial airline requirements in 2013 and beyond. Powered by Pratt & Whitney PurePower PW1500G engines, the CSeries aircraft family will offer a 15 per cent cash operating cost advantage and a 20 per cent fuel burn advantage. The CSeries aircraft's clean-sheet design is ensuring that the aircraft will achieve greatly reduced noise and emissions, as well as superior operational flexibility, exceptional airfield performance and a range of 2,950 nm. The CSeries aircraft will be up to 12,000 lbs lighter than other aircraft in the same seat category and will provide passengers with a best-in-class, widebody cabin environment in a single-aisle aircraft. Bombardier has booked firm orders for 138 CSeries airliners. Customers include Braathens Aviation (five CS100 and five CS300 aircraft), Deutsche Lufthansa AG (30 CS100 aircraft), Korean Air (10 CS300 aircraft), Lease Corporation International Group (17 CS300 and three CS100 aircraft), PrivatAir (five CS100 aircraft), Republic Airways (40 CS300 aircraft), an unidentified major network carrier (10 CS100 aircraft), an unidentified European customer (10 CS100 aircraft) and a well-established, unidentified airline (three CS100 aircraft). The CSeries aircraft program has also booked options for 124 aircraft and purchase rights for 10 aircraft from these customers, as well as Letters of Intent for up to 30 CSeries aircraft from Ilyushin Finance Co, and for up to 15 CS300 aircraft from Atlasjet.